I don’t know about you, but nothing is more inspiring than a well-told story. Currently I’m being inspired by Kristin Kimball’s The Dirty Life. I’m about halfway through the book and I’m smitten. Absorbed in the experience of her experience. 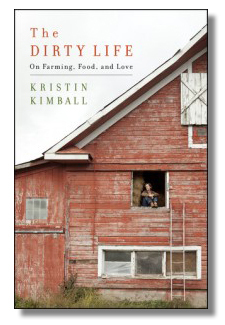 Kimball’s story follows the path many of us dream about: Woman renounces the fast-paced, packaged goods urban life for the grit of farming and love. Banking everything on a harebrained dream. Leaving the life she knows for a world of nothing but raising amazing food. Wouldn’t we all want to quit our day jobs and just dig in the dirt? And then you travel with her through the depths of winter, the back-breaking work, the tears, the strains, and the primal transformations. The work never ends. The farm always takes priority. But like any of us who give everything for something we love, the pain and the sacrifice are small prices to pay for the glorious reward. Kimball and her husband Mark’s passion for building a sustainable food culture is the core of the book. From the beginning moments of their relationship, it was a love borne by beautiful, fresh foods. As you read, you’ll feel a welling desire to fill your home with squashes and brilliant root vegetables. You’ll be desperate to pull them from the earth and bite through their skins while you’re still kneeling in the dirt. Nothing else will make sense but building a warm, wholesome environment of fresh offerings. It’s romanticism at its best. I think we’re all in danger of romanticizing farm life. Kimball’s brilliant imagery of the real work is an important dose of reality. You need to become entrenched in building the farm with her, so you’ll swear you’ll never leave your heated home for a rat-infested farm house. You’ll never pick up animal husbandry and all the blood, poo, and goo that comes with it. You’ll never break your body in the ways a farm demands you do. You will, however, realize that every bit of hard work you put into your patch of earth—stolen hours in the last winks of daylight, mornings you wake up with shredded muscles and throbbing blisters—are part of the amazing work you do to cultivate a beautiful thing. Which books have inspired your gardening life? I am just getting into gardening again (I swore to my Mom I would never do it when I had a choice in it) but right now I find canning books and blogs to be my gardening inspiration as I dream about what I could grow myself and then preserve.